Let’s face it, folks. To-Do Lists are a necessary evil of life. As a recovering Type-A personality I have a love-hate relationship with To-Do Lists. On one hand I love them. They help me capture all of the things floating around in my head so I can prioritize my time, hopefully stay focused, and make sure I don’t forget something important. On the other hand, I hate them. The list rarely, if ever, actually gets shorter and it can easily dictate my life if I let it. Oh, and let’s not forget how rewarding it feels to cross something off the list! Sometimes I put things on it just so I can check them off (Wake Up. Check!). Yet, another second or two later I’ve already forgotten the joy of accomplishment because I’ve moved on to the other 17 things on the list. This false sense of accomplishment shifts the focus on getting through the list and at the end of the day I’m left wondering where the time went and what I actually did. So I wonder… how can we transform our daily to-do lists into something more meaningful and satisfying? When I look back over my life, it won’t be the things I’ve checked off a list that will matter. It will be whether or not I have lived a life of meaning, authenticity, and love. It won’t be about what I did but about the kind of person I strived to be. 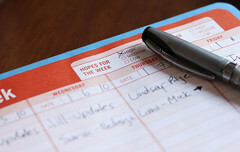 Creating a ‘To-Be’ list is one way to keep the To-Do List in check by helping us balance ‘being’ and ‘doing’. So try this: Before making your ‘To-DO’ list, create your ‘To-BE’ list. Ask yourself, “How do I want to BE in my daily life?” Think about each area of the 8 Components of Personal Wellness and what qualities you want to embody. What do you need to bring into your being in order to be your best self and live your best life? Then, when you make your to-do list, two things can happen. First, the things you typically don’t look forward to suddenly have meaning. If you can relate them back to something that is important to you, you may begin to embrace even the peskiest of chores. Here’s an example: One item on my To-Be list is “To be peaceful and calm.” I know that, for myself, a clean and clutter-free home brings me feelings of peace, calm, and joy. The opposite – a cluttered, messy home – makes me tense, anxious, and distracted. So when I put “15-minute house pick up” on my daily list, I know that task means a lot to my wellbeing. Second, a To-Be List can help you bring things into your life that support your intentions. Another Example: Perhaps “Being a supportive and trusted friend” is on your to-be list but you realize that time with friends is scarce. You can then make the conscious effort to add in time to nurture your friendships. It gives you a way to make sure what you DO supports who you want to BE. Creating your To-Be List can help you transform your To-Do List into something more meaningful so you can focus on being your best. In the process, you may even find there are things that need to come off your list altogether – but that’s a topic for another day.